So how do Adaptive Joins work? For Batch Mode Adaptive Joins, the goal is to not pin join choice to a specific type at compile time. 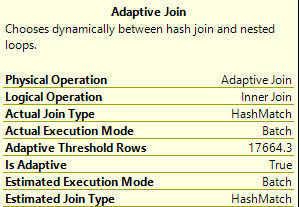 When available, Adaptive Joins allow the optimizer to choose between Nested Loops Joins and Hash Joins based on row thresholds at run time. At this time, Merge Joins are not considered. Pure speculation is that needing data to be sorted, or needing to inject a sort into the plan would add too much overhead when changing the course of a query. When Do Batch Mode Adaptive Joins Occur? At this time, Batch Mode query processing requires the presence of a ColumnStore index. They also require, well, a join, and an index that allows for the choice of a Nested Loops or Hash Join. 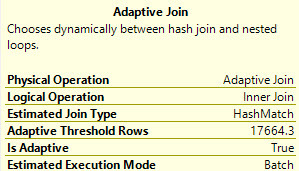 How do I know if my Join is Adaptive? Query plans for adaptive joins are quite distinctive. The Adaptive Join operator is new to SQL Server 2017, and currently has the following properties in actual execution plans. Estimated Join Type: Rather self-explanatory! Most notably, the Actual Join Type is missing. What breaks Batch Mode Adaptive Joins? They're identical except that the second query selects the DisplayName column, which has a type of NVARCHAR(40). 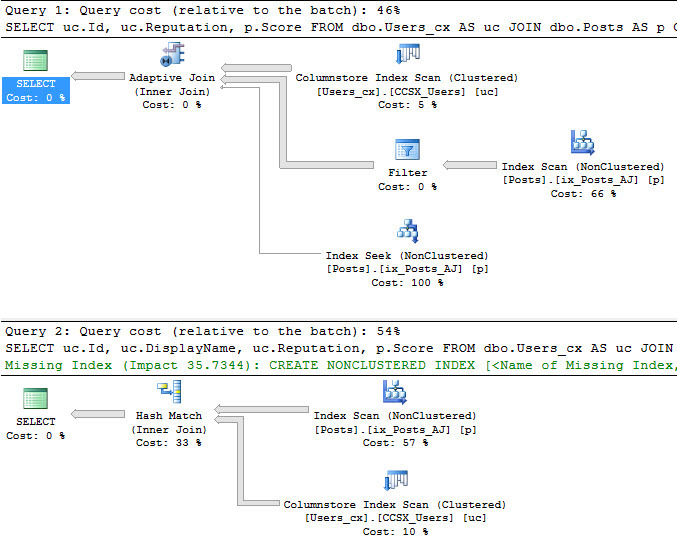 The Batch Mode Adaptive Join is skipped for the second query, but no reason is logged to the XE session. It appears that string data remains the steadfast enemy of ColumnStore indexes. There are other query patterns that fail to get Adaptive Joins, that also do not trigger events. One thing that will trigger this event appears to be the presence of a Repartition Streams operator. 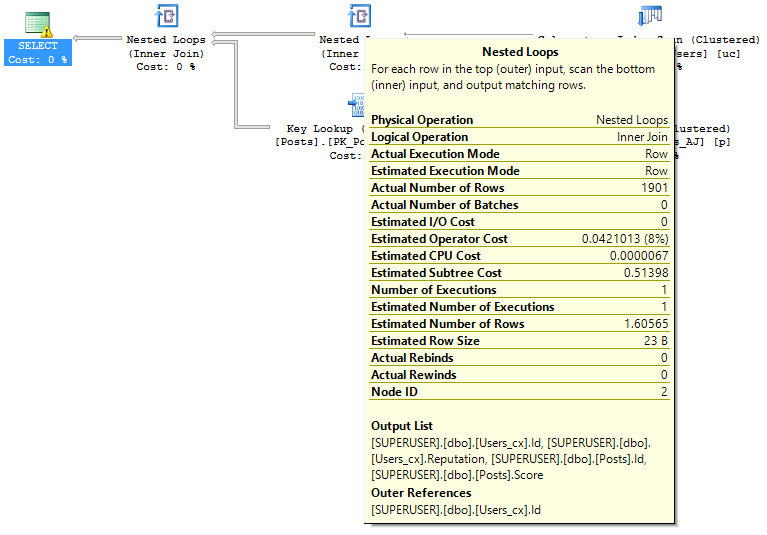 In this query, the partitioning type is Hash Match. Special thanks to the Intergalactic Celestial Being masquerading as a humble blogging man known as Paul White for the bizarre query. Query patterns that rule out join type, for example Hash and Merge joins require at least one equality predicate. Writing a join on >= and <= does not trigger the event. No known query patterns have triggered this event yet. One type of query that can trigger this event is a Recursive CTE. The reason here appears to be that the recursive portion of the CTE, which causes a serial zone in the plan, disallows Batch Mode Adaptive Join choice. The resulting query chooses a Row Mode Nested Loops join to execute both the Key Lookup and the table joins, which triggers the event. Another example is a query that skips the narrow nonclustered index in favor of the PK/CX. In this case, the PK/CX does not lead with OwnerUserId, so the only join choice is a Hash Join. In both cases, the "unmatched outer" seems to indicate that the index chosen does not sufficiently cover our query. Do Batch Mode Adaptive Joins work with multiple joins? Joining from one ColumnStore index to multiple Row Store indexes will yield multiple Adaptive Joins, whereas a join between multiple ColumnStore indexes will not be Adaptive. The first query joins one ColumnStore index (on Users) to two Row Store indexes on Posts and Comments. This yields two Adaptive Join operators. The second query joins two ColumnStore tables (Users and Comments) to one Row Store table (Posts), and yields one Adaptive Join. Is there any overhead to Batch Mode Adaptive Joins? Yes, all Batch Mode Adaptive Join plans receive a memory grant. This isn't always the case with Nested Loops join, unless they receive the Nested Loops prefetch optimization. The memory grant is to support a Hash Join should the plan require one based on row thresholds. Not the answer you're looking for? Browse other questions tagged sql-server sql-server-2017 adaptive-joins or ask your own question. SQL Server 2017 Enterprise vs Standard Edition?